The opera Dr. Atomic, with music by John Adams libretto by Peter Sellars, was first produced at the San Francisco Opera in 2005. 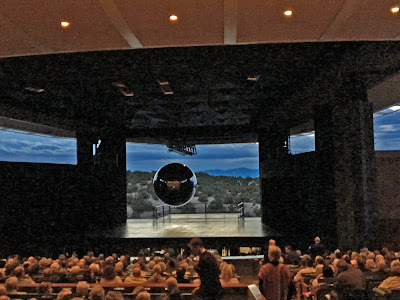 There has been a whole lot of hype as it has come to New Mexico, home of the atom bomb, in a new production staged by Sellars for the Santa Fe Opera. I was seduced by this, knowing full well that contemporary music has often been difficult for me, but my wife reminded me that I had enjoyed Nixon in China by the same team. So we got tickets. Little was I prepared for the assault that was awaiting me. The set is simple, a silver ball hanging mid stage. As it reflected the lights shone on it I was reminded of a disco night club. ,Of course, it symbolized the core of the atom bomb that hung on the tower at the Trinity site in the desert of New Mexico where the first test took place. Here is the image of the set and a link to part of the overture. You can let me know what you think. 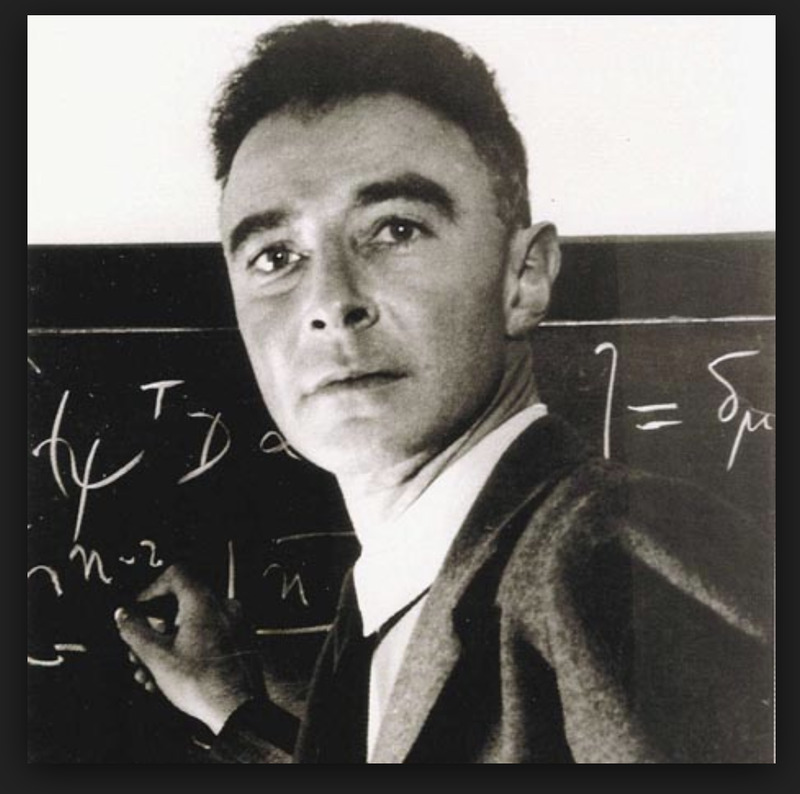 “The Manhattan Project”, was a military operation headed by General Leslie Groves with a team of scientists under the direction of the American theoretical physicist J. Robert Oppenheimer. They displaced a small boys’ school to build in the utmost secrecy what became known, in the post war era, as the Los Alamos National Laboratory. To accentuate the previous statement about secrecy, wives of the scientists and all the support workers brought to the new makeshift community could not know what was going on, other than it was a top-secret government project. 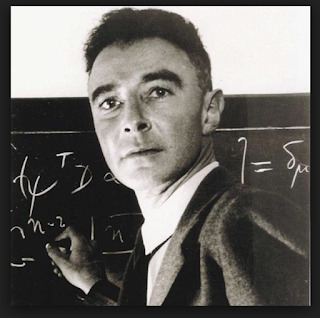 In the 1930’s Oppenheimer professed his very leftwing views and was never totally trusted by the government. In later years he said that he did not feel guilty about creating the bomb just the use of it! In his defense, of course, was the fact that the Allies knew the Germans had already discovered how to split the atom in 1938 and were sure were also working on creating an atom bomb. The Manhattan Project continued, however, after the German surrender. The bomb dropped on Hiroshima and Nagasaki brought an end the waning war with Japan. The timing was significant since because Truman was going to have a summit meeting with Stalin… effectively inaugurating the Cold War with “see what we can do”! The hype here has been more about the story of Los Alamos, Oppenheimer and the atomic age than it has been about the opera. We saw a showing of “Wonders are Many”, a documentary about the making of Dr. Atomic and its first performance in San Francisco. The original production was set in the historic moment and it made a lot more sense. In San Francisco the bomb was realistic with all its actual surface paraphernalia: not abstract, representing the broader idea of nuclear weaponry. The setting was literal and did not depend on the mountains and lights of Los Alamos that you could see in the distance beyond the open stage, an effect which was admittedly awesome. Also, the orchestration here seemed to depend a lot more on the percussion, which probably had much to do with poor miking since the greater number of strings in San Francisco seemed to lend themselves to a more peaceful effect. The horror of the atomic bomb was quite tense enough. Trying to sing over the orchestra was a chore some of the singers were not up to, again poor miking, leading to what I heard as screeching. One of the star singers in San Francisco said, “I had to be counting all the time. You don’t need to count for Mozart.” That summed up the music for me. There were protests in town which I thought at first were about the opera which is plenty dark and does not at all romanticize the “Manhattan Project. Rather the justifiable resentment was aimed at the official tourism campaign that promoted this summer as the “Atomic Summer” in Santa Fe. Why are passions high? They center around a group I was not acquainted with before, known as “the downwinders”. These are the people who are still affected by the radiation spread by the atomic tests. Today the Lab continues to work on weapons of mass destruction since the government will only give funds for that purpose and none for environmental cleanup of atomic waste! Maybe Santa Fe’s “Atomic Summer” is not all bad if attention is called to the fact that these issues still exist after almost 80 years. Needless to say, with the eight pueblos in the neighborhood they are a very significant group of down winders. To relate the opera more to the locale as an introduction to the opera members of the Santa Clara, San Ildefonso and Tesuque tribes danced together for the first time ever in an abbreviated version of the corn dance. Indian dances are not known for their melodies, but this seemed far more melodious to me than the score of the opera! In life there is often a plus side to every negative situation and one of the plusses of the “Atomic Summer” is an exhibition put on by the Friends of Tony Price, an artist who moved here from New York in 1968. At the time the Los Alamos lab sold surplus and the artist could go in and buy copper and steel at the going price of scrap metal. He made some wonderful sculptures out of this discarded material. More about him next week.